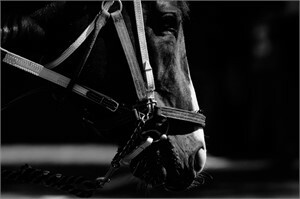 Long Shot is a photographic series that captures the speed, intensity, stamina and raw power of thoroughbred racing. At the track, by the time you make it out to the stands, all you experience is the sound. The warning call from the trumpet to let you know the horses are on the track. Then, the race. Through the megaphone, excitement builds as the race progresses. It is a rush, and it happens so fast. 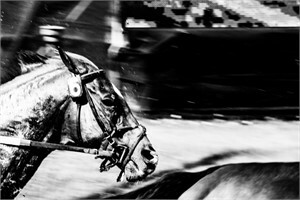 This series celebrates the poetic nuances of horse racing that happen within a fraction of a second. All photos were taken at Vancouver’s historical Hastings Racecourse, a place where Yap would visit fondly as a child. Mel Yap’s Battle on the Backstretch casts an inquisitive eye on the backstretch of the Hastings Racecourse. Two horses employ the center of the composition. One wears a headgear; the other, a padded nose cuff. Genetically programmed to fulfill a predetermined destiny, each horse attempts to deliver the command of its jockey and the telepathic dreams of its bidders. The jockey perches on top of his horse, physically and mentally seeking solidarity with his machine. He is at-one with the animal; their bodies, coupled into a unitary vehicle. 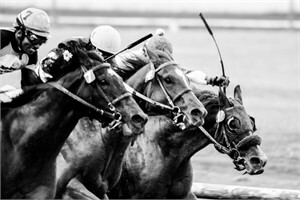 The intensity of the race is perhaps best registered in the pulsating veins of the horse’s hind limb. On the verge of bursting through its membranous confinement, the protruding vessels tantalize the surface and eroticize its anatomy. The powerful staunches of the forthcoming creature conjure up a veil of dirt. The mud here does not connote filth but heroism. It ennobles rather than diminishes. The pristine outfit of the jockey and the meticulous grooming of the horse are intentionally ephemeral to underscore the raw aftermath of an unforgiving race between man and beast. 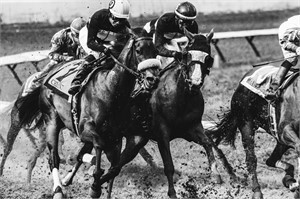 Battle on the Backstretch captures the destruction and rebirth of elegance. After all, a knight with a shiny armour is a knight that has never seen battle. 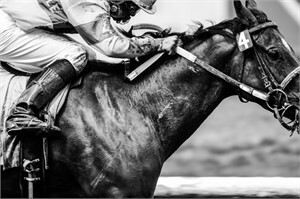 Long Shot is a photographic series that captures the speed, intensity, stamina and raw power of thoroughbred racing. At the track, by the time you make it out to the stands, all you experience is the sound. The warning call from the trumpet to let you know the horses are on the track. Then, the race. Through the megaphone, excitement builds as the race progresses. It is a rush, and it happens so fast. 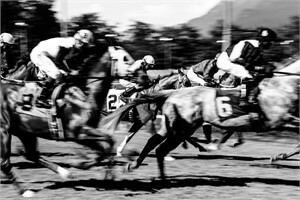 This series celebrates the poetic nuances of horse racing that happen within a fraction of a second. All photos were taken at Vancouver’s historical Hastings Racecourse, a place where Yap would visit fondly as a child. On Mel Yap’s Battle on the Backstretch (by Alice Wang) Mel Yap’s Battle on the Backstretch casts an inquisitive eye on the backstretch of the Hastings Racecourse. Two horses employ the center of the composition. One wears a headgear; the other, a padded nose cuff. Genetically programmed to fulfill a predetermined destiny, each horse attempts to deliver the command of its jockey and the telepathic dreams of its bidders. The jockey perches on top of his horse, physically and mentally seeking solidarity with his machine. He is at-one with the animal; their bodies, coupled into a unitary vehicle. 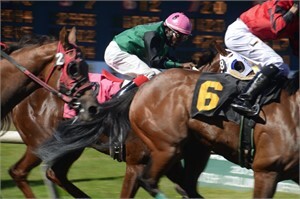 The intensity of the race is perhaps best registered in the pulsating veins of the horse’s hind limb. On the verge of bursting through its membranous confinement, the protruding vessels tantalize the surface and eroticize its anatomy. The powerful staunches of the forthcoming creature conjure up a veil of dirt. The mud here does not connote filth but heroism. It ennobles rather than diminishes. The pristine outfit of the jockey and the meticulous grooming of the horse are intentionally ephemeral to underscore the raw aftermath of an unforgiving race between man and beast. 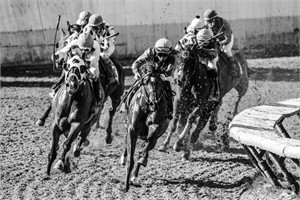 Battle on the Backstretch captures the destruction and rebirth of elegance. After all, a knight with a shiny armour is a knight that has never seen battle.